Four-time champion John Higgins is out of the World Snooker Championship after a 10-7 first-round defeat by fellow Scot Alan McManus. Higgins trailed 9-4, but a 111 break started a run of three frames which brought the deficit down to two. 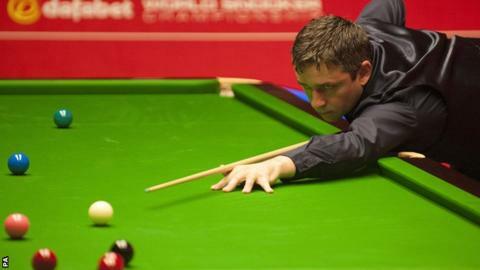 But he missed a blue in the next and McManus sealed a tie with Ken Doherty. In the evening session, Ricky Walden beat fellow Englishman Kyren Wilson 10-7, while Northern Ireland's Mark Allen leads Michael Holt 5-4. Higgins (11) is the latest seed to exit the tournament after defeats for Ding Junhui (4) and Stephen Maguire (10). McManus, 43, who will play in the second round for the first time since 2005, is a year younger than Doherty, who won the tournament in 1997. The 1994 Masters champion told BBC Sport: "It was a bit of a tense finish. It's never easy to put John away. "Although he probably never played as well as he would have liked, he came on strong towards the end and I kind of just fell over the line so I feel very fortunate." McManus was made to toil against Higgins, who had taken the final two frames of their opening session on Monday to slow his compatriot's charge and cut his arrears to 6-3 overnight, but any momentum the 11th seed might have felt failed to influence his performance on the resumption. A fluked red gave Higgins the impetus to stop the early-morning rot and get back to 8-4 and, after losing the next to move within a frame of defeat, he belatedly found some vintage form, with the 38-year-old posting breaks of 111, 67 and 94 to narrow the gap to 9-7. McManus trailed in the next frame, too, but Higgins missed the blue when he looked like going just one frame behind and his good friend seized the unexpected match-winning chance to face fellow veteran Doherty. The Irishman progressed to the second round for the first time in eight years with a 10-5 victory over Stuart Bingham. Elsewhere, Judd Trump took a 6-2 lead over Tom Ford without having to be anywhere near his fluent best. The opening four frames were shared, but Trump, who lost 18-15 in the 2011 final against Higgins, won four scrappy frames after the mid-session interval to take command. On the other table, Barry Hawkins also struggled early on before battling to a 5-4 lead over qualifier David Gilbert. The world number four trailed 3-1 but rallied after the interval and breaks of 72, 115 and 69 gave him a slender lead to take into Wednesday morning's concluding session. Allen and Holt will resume their second-round tie at 1900 BST on Wednesday.